Together with Yate and Sodbury District U3A Quilters, we attend the Craft4Crafters event at Shepton Mallet promoting PLUK and selling oddments of fabrics unsuitable for our quilts. This year we ‘inherited’ the Exeter show as well which, whilst a long way away, was a fabulous event. We met Loren whose Mum had ‘missed the Linus lady’ at her most recent hospital visit so we took this quilt from the display. Loren refused to let anyone straighten the quilt for the photograph and held it tightly. It was an absolute joy to see her so happy with the quilt. As Mary, my helper on the day, said ‘That’s what it’s all about’. I wanted to thank you for the beautiful blankets that you and your friends made for some of the children I currently support. I visited one family today (two brothers aged 7yrs and 9yrs) and handed over the blankets to their parent’s. Both mum and dad were delighted and are very excited to see their boys’ reaction when they come home from school. Both boys have complex needs and require 24-hour care. The younger boy is struggling at the moment. He is profoundly autistic. When mum opened up the bag with the Spiderman blanket she was in tears. Both parents asked me to contact you and pass on their thanks. Both boys will get so much out of their blankets that will go far beyond keeping them warm. I am sure it will provide them with a lot of fun, joy and security. So, thank you Elspeth and all your friends. I will remember you all in my Prayers. Thank you very much for the quilt for our son. This was given to us last week at the Sick Kids hospital here in Edinburgh where he had emergency treatment on the neurological ward for a brain tumour. The gift really brightened our hospital day and as you can see still provides comfort now that we are home. It’s useful as a knee blanket, and when he is well enough to go out, it will be useful as a wheelchair blanket. 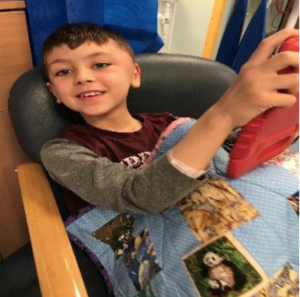 He will spend much of 2018 in treatment so the gift will be useful for a long time to come. Dean Patchwork, Edinburgh are one of a number of generous quilting groups in this area which regularly supply us with quilts. Some give them in ones or twos as they are finished and others save them up or have a workshop day and then can give us 20- 50 at a time – As long as they don’t all choose the same month to hand them over we can cope! This is a rather special quilt. 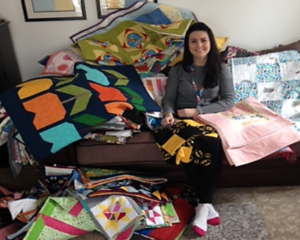 Some time ago we were asked by staff in the Family Support Unit of the Royal Hospital for Sick Children, Edinburgh if it would be possible to involve children receiving palliative care in the making their own Linus quilt. This was a challenge we were very keen to become involved with, and this quilt is the first one finished. Everyone is delighted with the result which has been a real joint effort. A number of other quilts are in the process of being made, with lots of different designs chosen by the children concerned. This young girl requested hearts and princesses, so we drew outlines of hearts and a princess on white pure cotton fabric squares backed with iron on Vilene. The palliative care nurses took the squares and some fabric paints to the child who completed her own design. The finished blocks were then returned to one of our quilters who fixed the dyes, cut out the shapes and appliqued them as a central panel on the quilt. She was so happy to do this she made an extra mini quilt so that teddy could have one too! The Edinburgh Children’s Hospital Charity has been very supportive of this scheme and awarded £750 to cover the extra costs involved. I just want to say a huge thank-you for the quilts, knitted baby blankets and baby cardigans. They are a huge help to the children and families we work with here at Rotherham Council. Within my team we work with vulnerable children who are subject to child protection planning and, in some cases, have been removed from their parents and are “looked-after” children. 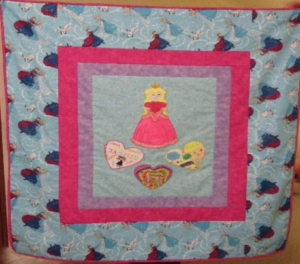 So far, we have used some of the quilts to give to “looked-after” children who have recently been placed in care, as a comfort blanket and something of their own to keep. One little boy was so enthusiastic about his new Batman quilt he was running around pretending it was a superhero cape. I have also provided some baby knitted blankets and a cardigan to an expectant mother who was really appreciative of them. 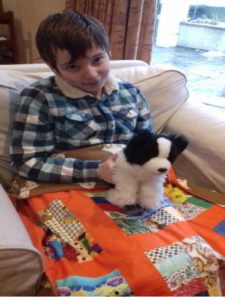 One of the young children I work with is autistic and really shy but gave a big smile when he saw his quilt and described it as “cool”. I have passed some of the quilts to our contact team who were extremely pleased to be able to use them in our contact rooms. This has made our contact rooms more colourful and they are used as play mats for babies when they are having contact with their parents. The work you do is much needed and is helping vulnerable young children, providing them with comfort and a sense of happiness and excitement. Baby Basics in Chesterfield held an Open Day recently which Pam and I went to – just as they were handing over one of their Moses baskets to a Health Worker who was taking it out to a young Mum. These baskets are filled with essentials for a new-born and some of our Linus baby quilts and knitted blankets, cardigans and hats go in them. What a lovely group of ladies they are! These quilts were made by a number of different people but were sent off to Five Valley Quilters in Nailsworth, Gloucestershire where they ‘pimp’ the quilts. This involves adding three dimensional flowers, textured fabrics, embedding buttons under the top fabrics and adding a squeak or a bell. All these ‘extras’ turn the quilts into sensory quilts for blind and partially sighted children. Everything is secured down to within an inch of its life to ensure safety. These latest ones have clearly been influenced by the weather! 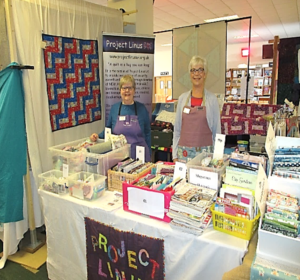 Heather Russell and Helen Scales manning the Project Linus UK stand at the British Quilt and Stitch show in Uttoxeter. We would like to thank Mary Ann Caranza and Norma Stolsworthy for helping out on Friday so that we could take a break. It was also nice to put faces to names of the Co-ordinators who stopped by to say hello. Some visitors and Co-ordinators dropped off fabric and thread for us to sell on the stall. We also received 16 quilts. All in all, a very successful 3 days. I started as a Project Linus Co-ordinator a couple of months ago. Since starting I have been given some very beautiful quilts made by one of the members of our local quilting group as a donation to this very worthwhile charity. These are the first quilts that I have received. I also made a couple of quilts myself to add to the pile! I have today delivered these quilts to two homes. Both these homes are near to Devizes, namely Cannon House and Julia’s House. Canon House is a seven-bedroom home that provides breaks for young children who have a severe learning disability and whose physical disabilities necessitate extensive use of equipment, require extensive medical needs and require significant attention at night time. They were overjoyed with the quilts when I presented the quilts to them this afternoon (14th March) and they could not wait to show the children and put them into their own bedrooms. I first met Louise upon arrival but within a few minutes of being there, the Manager and several other care workers who work at the home came into the office and absolutely fell in love with the quilts. I was very kindly shown around the home albeit that they were very busy people and very kindly gave me some insight as to what they are able to achieve at this home. Julia’s House is the first children’s hospice to open in Wiltshire and was officially opened by the charity’s Patron Martin Clunes on Saturday 6th May 2017. This new hospice gives families the chance to choose where they receive respite sessions and as well as offering access to top class facilities with specialist end of life care and social opportunities. I met Alice who very thankfully took the quilts to distribute amongst the home again giving me their precious time. The St. James’s Craft Group, Cruden Bay, Aberdeenshire handed over a magnificent collection of knitted blankets, quilts – some handmade; jackets, hats & bootees and bonding hearts for premature babies. Fay & myself, who are co-coordinators for N.E. Scotland, were warmly welcomed by Jan Blakey and all the other Group Members and were treated to tea and home-made cakes by the lovely ladies, some of whom were busy knitting Peterhead Poppies to remember family members who were lost in WWI. The poppies will be attached to a fishing net and will be suspended from a local church wall. I’m desperately wanting to thank someone for the beautiful quilt. My little boy has just turned 7 and we ended up rushing to Sick Kids in Edinburgh very unexpectedly. He underwent a very major operation and when he came round he had the most beautiful quilt which I understand was made by Project Linus. The workmanship that has gone into it is quite incredible and that someone would do that for someone they haven’t met is just amazing. It really touched us all at a time when everything seemed exceedingly bleak. Fast forward a week and he’s up and about and doing amazingly well although the prognosis is still uncertain. I would really like whoever made the quilt to see this pic of him, sitting up all snuggled up in it in Ward 7. The small quilting group at Appleton Wiske in North Yorkshire has been stitching for six years. Each year we produce 40-50 quilts and blankets which we put on display during our village’s Scarecrow Festival weekend in July, and then they are taken to our local co-ordinator for distribution. We meet fortnightly in each other’s homes and share ideas and techniques. Two of our group are knitters who produce colourful blankets, the rest of us machine or hand stitch using a variety of patterns and fabrics, and sometimes collaborate on a joint project which one member will then finish off. 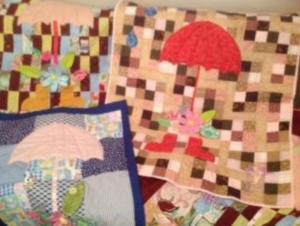 Our quilts have been passed on to a women’s refuge, a local hospice, a nearby hospital and to Social Services. Our annual exhibition draws many interested visitors and certainly makes the Parish Church look colourful!